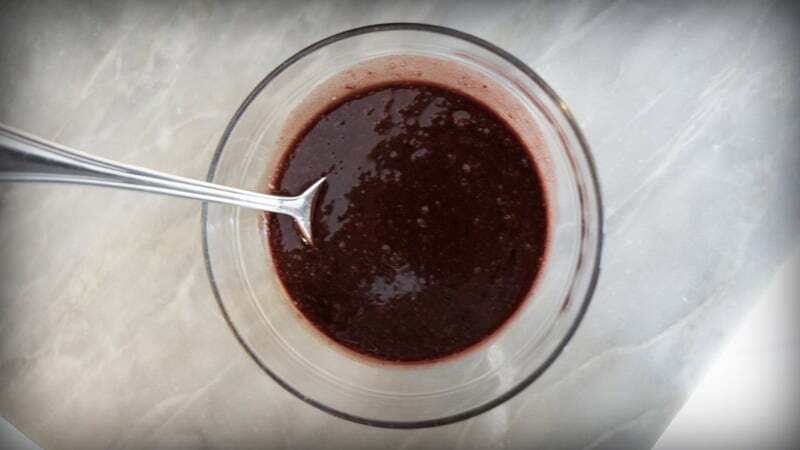 Red Wine Sauce, a flavor to enhance and elevate any meaty dish with elegance. Lucy Vanel, owner of the Plum Lyon Teaching Kitchen, walks you through the preparation of a sauce vigneronne, or red wine sauce, perfect for a harvest feast. Stretch your boundaries and serve a meal featuring wild game. If you spend some time discreetly hanging around near the stand of the volailler at one of Lyon’s outdoor markets this time of the year, among other comings and goings, you’ll inevitably see someone arrive and hand over the spoils of the hunt for a proper cleaning. Although this is more rare than we used to see, the traditional volailler is ready, at any given time to pluck, prepare, and truss various game birds coming from their clients. We see a variety of hunted game also for sale to the average consumer at the market. Pheasant, quail, wild duck, the occasional woodcock, wild rabbit, boar, and vension can be found this time of year, so you should take this as a particularly rich opportunity to stretch your boundaries and serve a meal featuring wild game and celebrating the rich flavors of the harvest. When you cook with game, remember that it stands up to more flavorful accompaniments, and this presents an opportunity to create an onslaught of harvest flavors that will take a meal to a level your guests will not soon forget. In addition to the rich flavors of the season’s wild mushrooms, meats that taste of life fully lived, wines that allow a certain philosophical meditation, and a staid, plainer element like a simple country potato cake like a criqueto keep things anchored, it’s important to provide a sauce that isn’t an afterthought. The one that I pull out of my sleeve at this time is the sauce vigneronne. It is not only a deep glistening shade of Côtes du Rhone that will add sparkle to any plate, but the flavor will enhance and elevate any meaty dish with elegance. It harmonizes beautifully with many of the things we associate with the harvest season in Lyon. Mise en place for a sauce vigneronne at the Plum Lyon Teaching Kitchen, Lyon France. 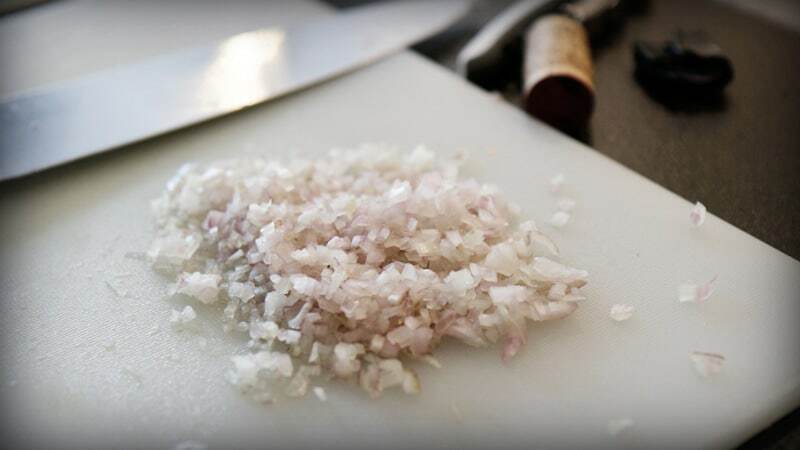 Begin with the shallots, dicing them quite small since you will not be straining this sauce. Melt half the butter in a saucepan, and add the shallots. Stirring constantly over medium low heat, sweat the shallots in the butter, until soft and any foam produced by the shallots has subsided. Add the wine, raise the heat to medium-high, bring to a boil, and reduce, that is allow the liquid in the wine to evaporate, until it is almost dry. The length of time this takes depends on the heat of your burner and your pan. Keep in mind that you can prolong this process by lowering the heat, and in doing so, the flavors of the shallots will infuse more effectively into the wine. It can take as little as 15 minutes or as long as an hour, depending on how you decide to play at this step. 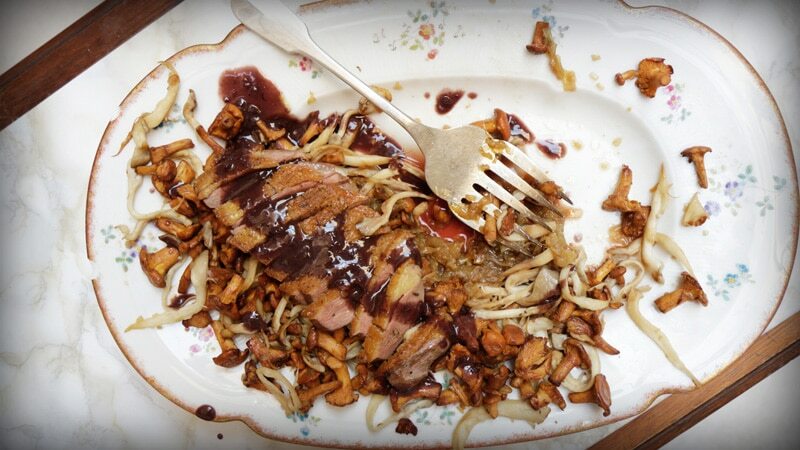 Harvest feast: breast of duck, chanterelles, royal trumpet mushrooms, and sauce vigneronne prepared by students at Plum Lyon Teaching Kitchen, Lyon France. 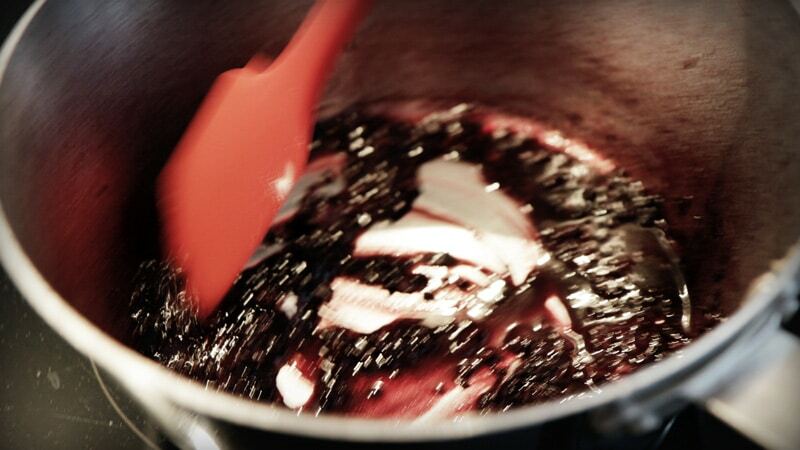 Sprinkle the flour over the shallot and wine reduction and stir to incorporate it, forming a sort of roux. Whisk the veal stock into this roux until it is smooth, raise the heat, bring to a boil, and stir it until it thickens. Reduce over medium-low heat to half its volume. Flavor with the cognac and keep warm until the meal is on the table. Stir the remaining butter into the sauce just before serving. Do not whisk to incorporate air, just gently stir the butter in until it is a glistening, rich sauce. Season to taste with salt and pepper. This sauce keeps for 3 days in the refrigerator and reheats without risk of breaking. Donec tempus Phasellus ut commodo risus. venenatis at felis elit.